Turn a lemon into a clock battery with this Lemon Clock Experiment Kit! Plug the Special Metal plates into a lemon and watch the clock turn on! The lemon acts like a battery when combined with the metal plates in this kit and powers up a small clock! 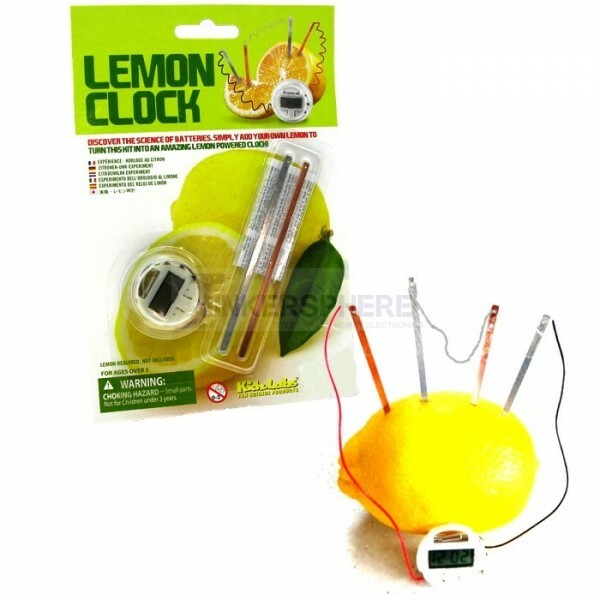 This Lemon Clock Experiment Kit gives you everything you need to harness the energy of a lemon and convert it into electricity! The electricity generated from the lemon is strong enough to power a clock! No batteries required, just a lemon! Recommended for ages 5 & above.